Appearing in Death in Paradise was my very first time acting in English. So the biggest challenge was to learn my lines in a very short time, make sure that everybody would understand me properly and express my character, Florence’s feelings as naturally as possible. Even if I know that people can hear my French accent, my goal is to provide the best English as possible when I act. I think Florence brings a touch of charm to the show, but that’s not the only thing. She is really into her job, she’s passionate and talented. She is an action woman, ‘une femme d’action’. Humphrey – I call him Humph – is the funny part of the series. He is intelligent yet clumsy and as talented as he is weird. He is indisputably the best detective the island of Saint Marie has ever known. In contrast to other police series, there is very little blood or any type of violence on screen in Death In Paradise, and I think that’s why it’s so popular both in Britain and France. It is quite different as a drama and those differences come from the beautiful scenery, the originality and complexity of the cases. Also the relationships between the characters and of course, the British sense of humour. You have to be very careful when you speak French around Kris Marshall, who plays Humphrey. He understands almost everything! I am very impressed with his learning capacity. He’s really involved with the French crew while we film in Guadeloupe, speaking and joking around in French with them on a daily basis. I’m not sure I can tell you what French phrases I’ve actually taught him… Let’s just say that most people, when learning a new language, are only interested in ‘funny’ words. Joséphine Jobert plays Florence in Death in Paradise. 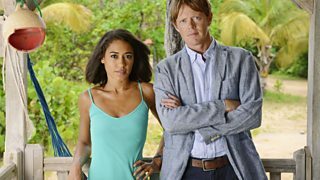 Death in Paradise, series five, continues on Thursday, 14 January at 9pm on BBC One. Each episode will be available to watch in BBC iPlayer for 30 days after broadcast on TV.